The past period has seen the visit of a lot of leaders and ministers of state to the capital Baghdad, some of them had negative attitudes from the political process in Iraq, and some of them had positions supportive of Iraq during the war on a supporter. This week, a number of officials visited Jordan, including Jordan's King Abdullah II, Iranian Foreign Minister Mohammad Javad Zarif, French Foreign Minister John Yves Laudrian and US Secretary of State Pompeo following a secret visit to his base by President Donald Trump. 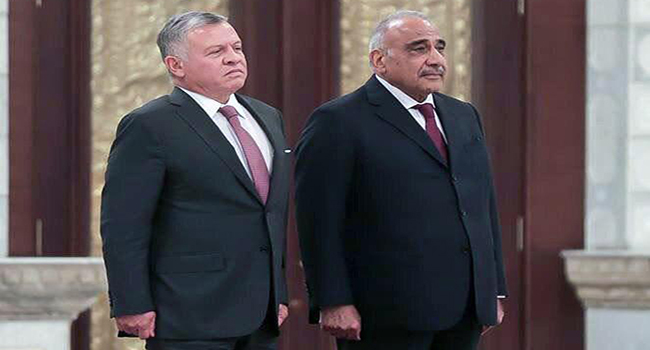 On Tuesday, Prime Minister Adel Abdul-Mahdi revealed growing interest in Iraq and a change in the climate of dealing with neighboring and distant countries. officials said, "Some countries that had negative attitudes of the political process continued with the Iraqi leadership, to start a new page of Relationships based on common interests Yen countries and non - interference in the internal affairs, in addition to keeping the sovereignty and unity of Iraq. " "The visit of leaders and officials, including the Jordanian monarch, is proof that Iraq is taking steps towards political and developmental stability, and international investment companies are looking at this," said Foreign Affairs Committee member Hamad Taha Amin in an interview with Mawazine News. And will pave the way for companies to invest in post-urging and participate in reconstruction. " "The international relations are based on interests, the superpowers are looking for their interests, and Iraq has to preserve its common interests with these countries," he said. To this, a member of the Foreign Relations Committee parliamentary Iqbal Abdul Hussein Al-Mathy, to conduct visits to Baghdad to personalities in countries that had positions against Iraq. "Iraq, after its victory over the most powerful terrorist organization in the world, has become a kiss for all countries and to ensure its political and economic interests in the future, high-level officials have begun to come to Iraq to talk about the future of relations between the two countries," al-Mathai said in a statement. Al-Matai expected "to visit more responsible figures, especially those whose countries had negative positions on Iraq during the next phase to open a new page of relations and participation in reconstruction, services and infrastructure in most areas of Iraq, whether those affected by terrorist operations or other."